After roses that have been left on the bush bloom and fade, their petals fall and round nubs develop at their bases. These are the fruit of the rosebush and are called rose hips. 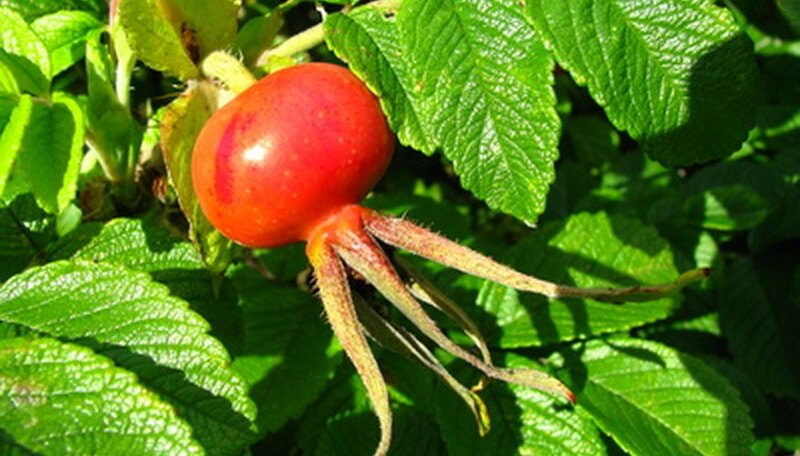 Rose hips are nutritious, high in vitamin A and C content, and are often used in jellies, jams and teas. Rose hips also have medicinal benefits; according to the University of Maryland Medical Center they can help reduce inflammation and treat conditions such as osteoarthritis. You can purchase rose hips at health food stores, or harvest your own from your garden rosebushes. Allow your roses to remain on the plant until the petals drop and rose hips develop. It is best to harvest the rose hips after the first frost, when they have turned red and become softer. However, don't let them get very soft and wrinkled. Snip the rose hips from the rose bush right where the hip meets the stem. Make sure your shears are clean and sharp before you begin. Place the rose hips in a colander and rinse them off with lukewarm water. Cut the ends and the stems off from the hip, getting as close to the hip as possible without cutting into it. Set the rose hips in a single layer on a paper towel and allow them to air dry for a few days. When the skin of the hip begins to wrinkle, it will be easier to remove the seeds from the hip. Cut the hips in half lengthwise, from top to bottom, and carefully scoop out the seeds and hairy pulp that is inside the hip. Rinse off with lukewarm water, and spread the halved hips out on a paper towel and dry them with another towel. Turn your oven to its lowest setting, which is usually "Warm" or 150 degrees Fahrenheit. Cover a cookie sheet with a piece of parchment paper and lay the rose hips on the paper. Put them in the oven, with the oven door cracked open, for two hours. Allow the rose hips to cool on the counter before putting them in a glass jar for storage. Store the glass jar in a cool, dry cupboard. While all roses produce rose hips, traditional bush varieties such as the rogusas generally produce larger, plumper hips than modern varieties and hybrids. A nursery professional can recommend good varieties for rose hip production. If you treat your rosebushes with a pesticide, make sure it is clearly labeled as safe for food crops. Organic pesticides are likely to be safe, but still need to be checked. Rose hips can also be dried in a food dehydrator. Check your model's user guide for instructions. Do not use rose hips from any rosebushes that have been treated with a pesticide that is not clearly labeled as safe for food crops. Aluminum pans and utensils can destroy the vitamin C content in rose hips, and should be avoided during the process of drying them. This is why the sheet of parchment is placed on the cookie sheet.